Fabulous Toll Brothers built home with elegant upgrades inside and out. Enjoy gorgeous curb appeal, soaring ceilings, stone fireplace, crown moldings, office, loft, game room. There's a large screened patio with sparkling pool and spa, fenced side yard that is perfect for pets, and private cul de sac location. Enjoy resort style living in Palm City's premier yachting & golfing community situated on the St. Lucie River w/low HOA fees of $381 per mo include guarded gate, Riverfront Clubhouse w/large heated pool, fitness ctr, meeting & game rooms, library, tot lot, bbq & paddleboard/kayak storage. Enjoy tennis, golf & a bite to eat at the Palm Cove Grill. Many fun social events to attend & clubs to join. Enjoy great shopping, dining, & theater in nearby Historic Downtown Stuart, Martin County "A" rated schools, close to I-95, Trnpk & beautiful Hutchinson Island beaches! Easy commute to PBI Airport. Whether you prefer contemporary or traditional design, Palm Cove Golf & Yacht Club offers many style floorplans. It is truly the perfect place to call home. 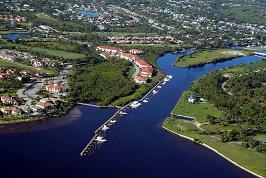 Boat slips are available in the nearby community marina, with security and easy ocean access. Experience the best of waterfront living within a guard gated social community. Not just a home it's a lifestyle!